“Innovation beyond the box” is not just a company slogan; it is a way of doing business at Charlotte, NC based Ferguson Box. With offices and manufacturing operations appropriately located on “Quality Drive,” this progressive and service oriented manufacturer has built a solid reputation as a complete packaging solutions provider. Ferguson Supply and Box manufactures and distributes custom and stock corrugated boxes, containers, displays, bags, packaging supplies, foam products, as well as graphic art and design services. With the company’s in-house structure and graphic design team, Ferguson has the ability to take a packaging concept from an idea to the retail shelf or safely into the customers’ hands. Their facilities were previously divided at two locations totaling approximately 212,000 square feet. After rethinking their processes, organizational methods, and material flow they elected to consolidate into one 185,000 sq. ft. modern facility and implement a “core” operation philosophy. With increasing business and a 27,000 sq. ft. reduction in their total building space, achieving maximum efficiency and organization was essential. 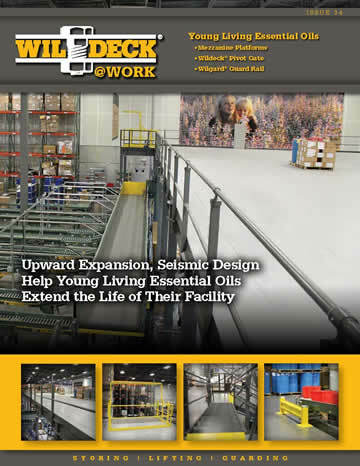 Wildeck® material handling solutions provided the necessary components to facilitate the reduction in square footage. More importantly, by strategically locating the mezzanine, a “core” area for supplies was established close to manufacturing. 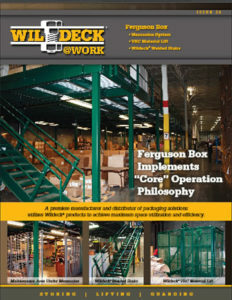 Terry Pridgen, Ferguson’s Plant Superintendent, simply states, “Wildeck products add SPACE.” With Ferguson’s focus on maximizing organization and shifting all operations to one smaller facility, the added space was integral to their material flow. 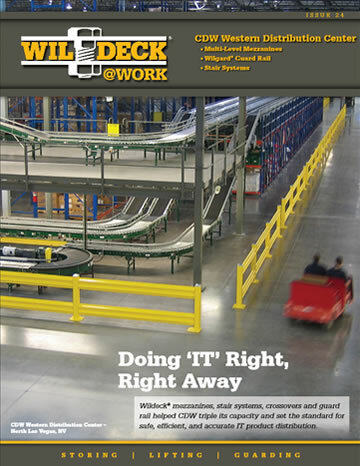 According to Pridgen, the added space and efficiency provided by the Wildeck® mezzanine and vertical reciprocating conveyor (VRC) have provided numerous operational benefits. Tooling storage for the converting machines, printing plates and dies. These delicate items damage easily and are costly to replace. 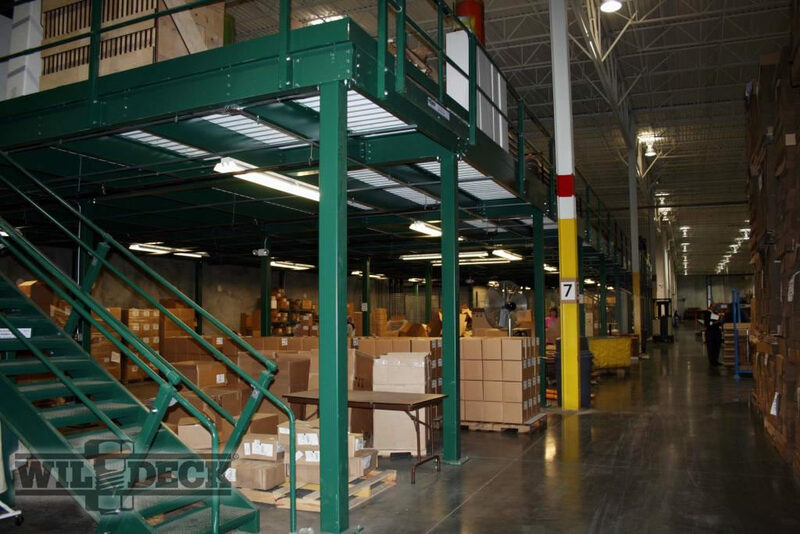 The mezzanine level protects and stores while the VRC easily transports material to the manufacturing level. Space optimization. The goal of manufacturing is to keep overhead costs low and maximize profitability. The cost of a Wildeck® mezzanine vs. the cost of increasing building floorspace is dramatically different. Economically, it is more advantageous to utilize existing overhead space. Mezzanines also qualify for accelerated capital equipment depreciation compared to the longer terms associated with permanent building improvements. 3. Central core location. In keeping with the organization’s philosophy, the improvements have kept necessary materials and components close to the manufacturing area, thereby maximizing production efficiency. Time savings. Ferguson prides itself on organization, which greatly reduces the amount of time on each job. The new process is one that anyone could learn with only one hour of training. Now, they do not have to rely on someone’s memory to locate specific materials. Aesthetic appeal of the plant. 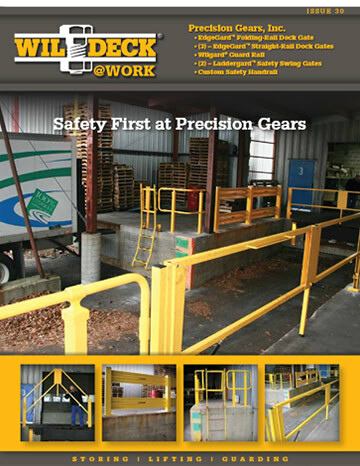 This is an often overlooked benefit of Wildeck’s mezzanines and lifts, but to Ferguson Box, it is a huge advantage for their business. Ferguson Box frequently invites its “A-list” clientele to tour the facility, and first impressions matter. The tour showcases the facility, which creates trusting relationships and increases business. An organized and uncluttered feel to the operations and facility convinces guests to trust Ferguson with their work. A smooth running and organized operation helps to showcase Ferguson’s quality and production efficiency. The tour promotes Ferguson Box’s strong customer service and validates them as a perfect fit for the customer. Terry Pridgen and Gene Massey, Plant Manager, are dedicated to organizing the plant, which is not just about operations; but presenting the full ability of the company. 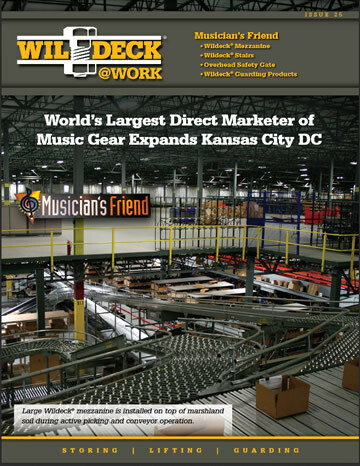 The Wildeck® mezzanine and material lift contribute greatly to the success of Ferguson’s operation in several ways. Safe storage. The mezzanine stores several key production items, including thousands of cutting dies. They tell the machines where, when, and how the boxes need to be cut and perforated. Delicate printing plates are also stored on the mezzanine. These two items are critical to their customers’ production and are easily damaged and prone to accidents. With some 4,000 of these items to keep safe at any time, Terry has plans to relocate to a new tool storage area to consolidate and maximize inventory space. Easy access. The VRC material lift operates frequently every day. Tooling is stored up on the mezzanine and when the tooling technician pulls items for their production schedule, the items are brought down on the material lift. Some of the box cutting dies can weigh thousands of pounds, so employees use a special cart to transport them onto the lift and to the machine. Ferguson Box’s unique ink station allows the company to make its own ink. By having the ink on location, they are able to fill customer orders faster and reduce ink inventory. At this point, Ferguson Box operates efficiently with two shifts using the space they currently have. Growth will fill their current operations, and when a third shift is added, space will have to be assessed, adjusted, and increased to accommodate the additional business. Terry Pridgen is extremely pleased with the combination Wildeck® mezzanine and VRC lift installed in Ferguson’s facility.